Give your restroom a new definition with an exclusive range of urinal modesty panels and vibrant coloured Privy Divider Panel laminates by Greenlam Sturdo. The panels are designed to provide the most comfortable bathroom experience. They ensure the privacy of users while keeping hygiene a top priority. 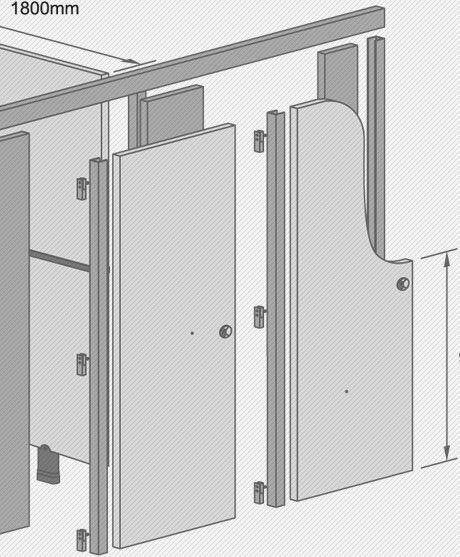 Welcome to a new world of bathroom urinal partitions! Our bathroom urinal partitions come with rust-resistant stainless steel fittings to ensure the highest quality. The urinal modesty panels are manufactured using 12mm thick Compact Laminates, in accordance to IS-2046-1995/BS EN-438(1)-91. Not only that, Greenlam Sturdo urinal panels consists of one undivided piece, chamfered edges with no joints in between which provides a cleaner and well structured look to your restroom space. These urinal modesty panels are equipped with the comprehensive series of conventional designs. They are also available in exciting colours and shapes, and guaranteed to give your commercial restroom space an exquisite yet organized look. Stainless steel L-clamp hardware fittings along with SS-304 screws are used to fix the commercial urinal partitions to the wall. If you are on the hunt for great quality commercial urinal partitions that are aesthetically pleasing and loaded with other desirable attributes, step into the Greenlam Sturdo world today. We have extensive experience catering to bathroom urinal and other requirements for diverse establishments. We are always ready to discuss your requirement and work with with you to find the best bathroom urinal divider design.